The Compulsive Reader: Cover Talk: New So Much Closer Cover! 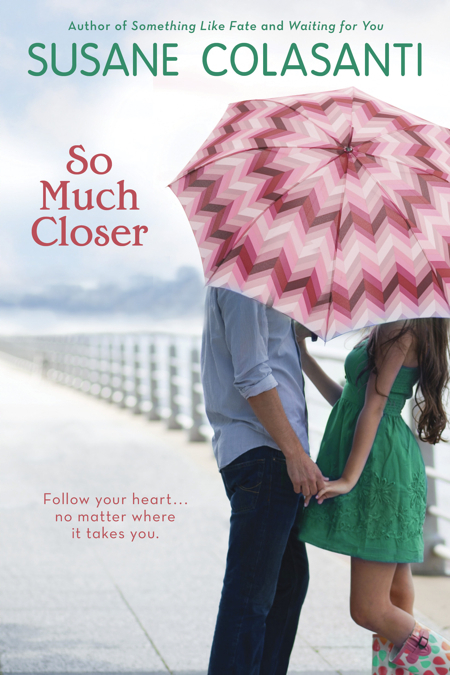 Cover Talk: New So Much Closer Cover! If you're a Susan Colasanti fan, you'll probably counting down until June 14th, the release date for her brand new book, Keep Holding On! (I read an ARC, it won't disappoint.) But...if you're having a hard time waiting, check out the paperback of So Much Closer, out May 1st! Along with being available in a new format, this is also the first of Susane's books to get an entirely new cover, and I can't say that I am disappointed. I liked the idea behind the original So Much Closer cover, but the main thing that made it so meh for me was the purple and pink color scheme of the girl's outfit--WAY too 1983! See what I mean? Check out Susane's perspective here. Fabulous! I don't know what it is about these sorts of cute, colorful, romantic covers that just appeal to me so much. I love the pattern of the umbrella especially. It's just so fun, and I like that you still get a feel for the city in the background. I thought the first cover was a bit awkward, because of how the two people on it were placed. I love the new cover! The umbrella and the dress and the way they don't match, but they *go*...so cute! I also really kind of like that you can't see what they look like, so you can really imagine your own versions of the characters!! Cover Talk: Throne of Glass Cover Reveal! Interview and Giveaway with Terra Elan McVoy!